IMS' 5S program begins with 5S Training that introduces the workforce to the concepts of SORT, SET-IN-ORDER, SHINE, STANDARDIZE, and SUSTAIN. Using a technique developed and perfected by the most efficient Japanese companies, the 5S systems revolutionizes the way an organization views itself and will enable people at all levels to make the connection between quality, efficiency and being organized. Sustain - Make the 5S system a management tool. Engage employees to continue and enhance the program. 5S is a foundational lean technique that works in practically any environment - production (including assembly, machining, and job shops), offices, labs, classrooms, hospitals and home. Anywhere work is performed is a great place to implement 5S. If an organization is interested in building enthusiasm to launch an improvement program, 5S is a great place to begin as it draws out the creative abilities of workers in a rewarding and engaging way. IMS offers personalized, customized service for 5S programs. With many years of experience delivering 5S consulting services and over 30 5S implementations, IMS can deliver on the promise of improvements from 5S. Whether the goal is productivity improvements, conformance to customer standards or enhancement of workforce skills, IMS is your expert provider of 5S training and 5S implementation services. 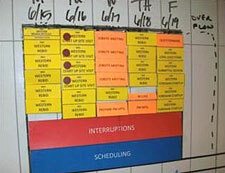 IMS uses a blend of 5S Kaizen activity to rapidly produce results for your organization. Please complete our contact form for further assistance with 5S services.